I will share a secret with you. I really dislike soldering chain. Not the nice open link style, like in a charm bracelet- no. I’m talking about the microscopic, get out four magnifying lenses, and then squint before you even start to see the link kind of chain. I dislike doing it for all kinds of reasons, but mostly I dislike it because I love this chain style, and it just about kills me to ruin a section. Which invariably happens on a semi-regular basis. So guess how many chains I need to make today? That’s right- lots! I also need to shorten a few that aren’t quite the right length, or that customers need fixed. I’ll have you know, repairing chain is a…. joy all it’s own. Ah well. 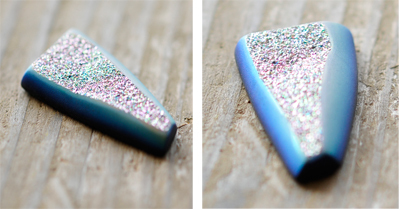 I’ll console myself with permission to design the setting for this stunning titanium Aurora Druzy. Definitely need to get all those chains done sooner rather than later.